At least 20 Revolutionary Guards have been killed in a suicide bomb attack in south-eastern Iran, state media say. 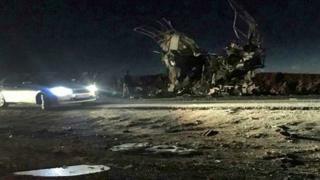 The bomber targeted a bus transporting personnel on the Khash-Zahedan road in Sistan-Baluchestan province, near the border with Pakistan. Another 20 Guards were wounded in the attack, the official Irna news agency cited an “informed source” as saying. The Revolutionary Guards branch in south-eastern Iran said in a statement that a unit of its ground forces had been returning from the Pakistan border area on Wednesday when a car filled with explosives blew up beside their bus. It did not give any casualty figures, but blamed “takfiri terrorists and mercenaries of the intelligence services of hegemonic powers”. “Takfiri” is a term used to describe Sunni extremists who see other Muslims as non-believers. The statement did not identify the “hegemonic powers”, but Iran’s foreign minister linked the bombing to a US-led conference on the Middle East taking place in Warsaw, Poland, that will include discussions about Iran’s activities in the region. “Is it no coincidence that Iran is hit by terror on the very day that #WarsawCircus begins?” Mohammad Javad Zarif tweeted. Wednesday’s attack was the deadliest in Iran since September, when gunmen killed at least 24 people at a military parade in the south-western city of Ahvaz.